Now Open – Our New Retractable Pool Enclosure! What’s NEW you ask?…. We now have a brand new Retractable Pool Enclosure!! For many years we have had an inflatable dome to enclose our 30’ x 60’ pool in the cooler weather. Many of our members have enjoyed swimming under the inflatable, but many have not been able to use the pool when it is up for various reasons such as humidity affecting persons with breathing problems or COPD, claustrophobia, etc. 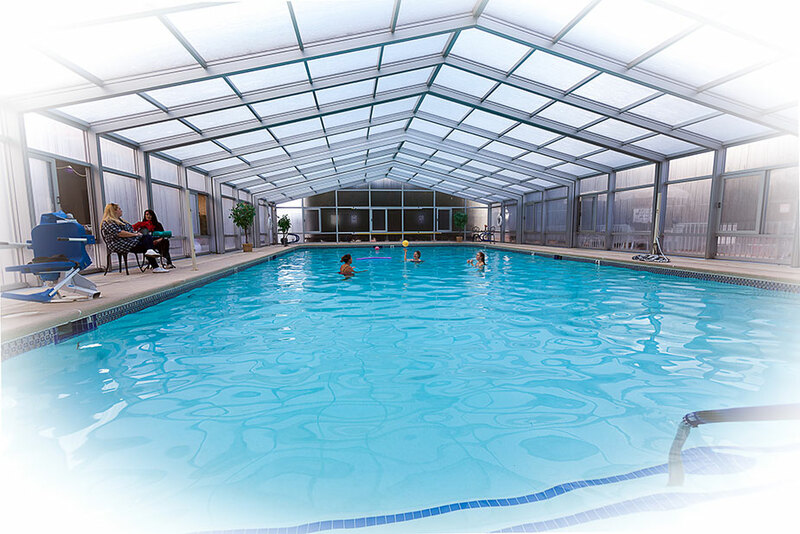 We decided to look for something everyone could enjoy, and we came up with DynaDome’s Retractable Pool Enclosure. Our new permanent pool enclosure has rigid translucent polycarbonate panels on the roof to let light through and clear Lexan (polycarbonate) panels on the sides to clearly see through. When in the closed position, any one or all of the fourteen 3’x5’ sliding windows with insect screens can be opened for ventilation. A great feature is that the panels and top are retractable! It can be easily opened from the center leaving as much as 45 feet of the pool exposed to the sky and open air. In order to make this fantastic new pool enclosure a reality, there have been a tremendous amount of hours and hard work put in by the Retractable Pool Enclosure Fundraising Committee and Park volunteers, along with generous donations by some of our members. The Fundraising Committee and their volunteers have toiled tirelessly providing many great dinners, lunches and breakfasts in our Clubhouse, yard sales open to the public outside our main entrance, raffles, games of chance, card games, and anything they could think of to bring this amazing new DynaDome Retractable Pool Enclosure to our resort.